Metallurgy is the process of working metal into objects, like tools or weapons. Although small amounts of metals are found in relatively pure form, most must be extracted from ore by separating the impurities from the metal desired. Metal tools are created by heating (smelting) and/or hammering the metal to work it into the desired object. Copper is a hard metal which must be separated from the ore it is mixed with. Copper metallurgy was invented before 3,000 BC. Perhaps copper was discovered in the process of manufacturing paint or in fashioning pottery in kilns which requires high temperatures to fire. The heated metal would have been separated from the slag by crushing the slag and picking out the metal by hand. 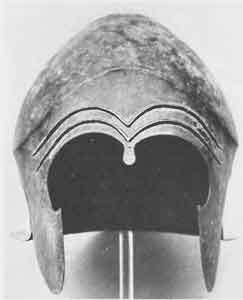 Since copper was relatively soft, however, it couldn’t be used for weapons or for tools needing sharp edges but was used for jewelry. 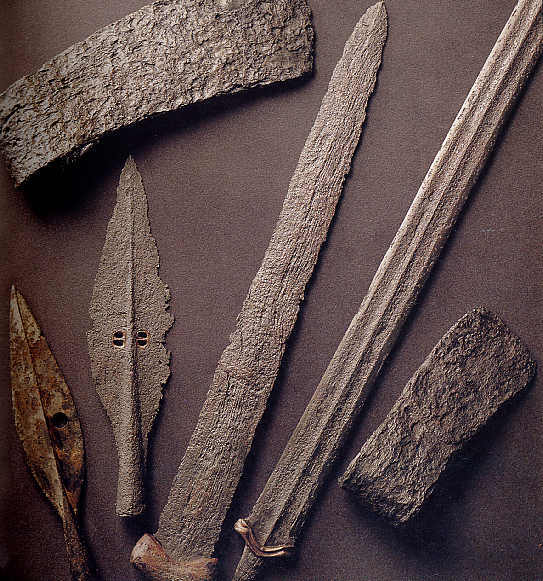 By 2,000 BC bronze, an alloy of copper and tin, was discovered for the manufacture of heavy duty tools, weapons and armor. Bronze was much harder than copper and could hold a sharp edge. Tin was difficult to obtain and major trade routes developed where tin could be mined.